Senator Amy Klobuchar throws hat into a crowded ring of Democratic candidates seeking to replace President Donald Trump. 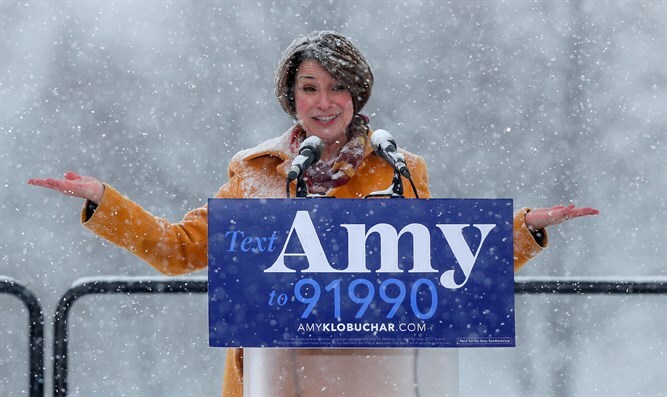 Senator Amy Klobuchar (D-MN) on Sunday announced that she would be running for president in 2020, throwing her hat into the crowded ring of Democratic candidates seeking to replace President Donald Trump. "On an island in the middle of the mighty Mississippi, in our nation's heartland, at a time when we must heal the heart of our democracy and renew our commitment to the common good, I stand before you as the granddaughter of an iron ore miner, the daughter of a teacher and a newspaperman, the first woman elected to the United States Senate from the State of Minnesota, to announce my candidacy for President of the United States," she said, speaking in Minneapolis, according to CNN. "That sense of community is fracturing across our nation right now, worn down by the petty and vicious nature of our politics. We are all tired of the shutdowns and the showdowns, the gridlock and the grandstanding," she told supporters who gathered on Boom Island, a park that juts into the Mississippi River in Minneapolis. "Today we say enough is enough. Our nation must be governed not from chaos but from opportunity," continued Klobuchar. "Not by wallowing over what's wrong, but by marching inexorably toward what's right." In her speech, she also took a swipe at officials in Washington, promising that her honesty will set her apart from them. The senator also went after Trump, criticizing the President's foreign policy and use of Twitter, albeit without mentioning him by name. Klobuchar’s announcement comes as the Democratic primary intensifies by the day, and one day after Democratic Senator Elizabeth Warren officially launched her 2020 presidential campaign at a rally in Lawrence, Massachusetts. Numerous candidates including Sens. Kamala Harris and Cory Booker are already in the race, and others, like Sens. Bernie Sanders, are expected to jump in soon. Other potential candidates include former Vice President Joe Biden, who recently claimed he is the “most qualified” person to serve as president, fueling speculation that he might make a 2020 bid for the White House. Former New York City Mayor Michael Bloomberg said on Friday that he would decide by the end of the month whether to seek the presidency.